I'm sure there are many ways to teach people how to code but I am going to use my own methods that I have developed while explaining VBA to my co-workers over the years. There is no way I can explain everything about coding here in this post but I will try to cover the basics and hopefully provide you with a good foundation that you can build on going forward. Hopefully everyone is comfortable seeing a structure like above and I am here to tell you that VBA coding is kind of setup like your computer's folder structure. I am a visual learner myself and I always find it easiest to explain how to write a line of code with an example. So let's write a VBA line that tells Excel to clear the contents of range A1:C50. This references the workbook that your VBA code is written in. Typically you use this when you want the macro to only effect one workbook. The benefit to this is that if you are viewing another workbook and you accidentally run your code it will not affect that workbook. REMEMBER YOU CANNOT UNDO A MACRO'S COMMANDS ONCE IT HAS RUN! Writing your workbook level reference this way allows you to specify the name of the workbook you want to take action with. I rarely refer to workbooks in this way because if I or someone else changes the name of the workbook, the macro will not be able to find it because it is referencing the old name. I don't believe I have ever used this form of referencing a workbook but I will throw it out there just as an FYI. When you use a number to reference a workbook you are referencing the order in which the workbooks were opened by Excel. This can get tricky because if you have add-in files active, those are going to be the first workbooks opened when your Excel Application starts-up. You can determine which position your workbook is in by referencing its order in the VBA Project Window (location is shown in Lesson Three). This is very similar in functionality to ActiveWorkbook. ActiveSheet points you to the tab that you are currently viewing. This is great to use when you want to give your code the flexibility to run on a worksheet of your choosing. In this form, you can spell out the name of the worksheet you want to target. Because your sheet name is considered text and is not part of the VBA language, you will need to make sure your tab name is surrounded by quotes. This lets Worksheet know that you are spelling out a name of a tab. If your name does not have quotes then VBA will think that Sheet1 is a variable that you created instead of text. You can also target the order of your worksheets. The above code is bringing you to the second worksheet from the left inside your workbook. Once we've specified the worksheet we want to modify, we then need to specify which cells we want to do something to (in this case, clear their contents). There are a bunch of nifty ways to tell VBA which range we want but here I am going to cover the two main ways for referencing a single cell and a range of cells. Range("A4") - You can reference a cell by inserting its string name (range name surrounded with quotes). Cells( 4, 1) - You can also reference a cell by using Cells( ) and inputting the row number and then the column number. Note that Cells( ) will not accept a letter as an input for the column number. Range("A1:E5") - Similar to referencing a single cell by name, you can also reference multiple cells by inserting the top left cell of your range, a colon, and then the bottom right cell of the range. Range(Cells(1,1),Cells(5,5)) - By embedding two Cells( ) references inside a Range( ) function, you can refer to multiples cells. To do this, use a numerical reference (row number, then column number) for the top left cell in your range and then do the same for the bottom right cell of the range. Congratulations! We have made it to the lowest level of what we wanted to modify or if you want to keep with the analogy we finally clicked on the folder that is storing our file. Now in this folder there are hundreds of files we can select so we need to specify which unique file we want to open. There are lots of different properties you can change and actions you can take at the Range level. You can change a color, you can perform a calculation.....you can do pretty much anything you can do manually on a spreadsheet. A benefit to Microsoft being the creator of both Office and Visual Basic is that most of the computer language is used in the program functionality. So in our example, if we wanted to delete the values in our selected cells while in Excel, we would simply go to the Home tab, click on the Clear drop-down in the Editing section, and click Clear Contents. 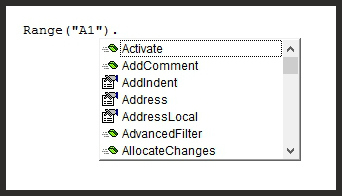 In VBA language to simulate doing the same thing all we have to add to our line of code "ClearContents". Pretty easy, right?! What's Up With All the Periods? Now that we have written a fully actionable line of code, you might be asking yourself what is the significance of putting a period in-between each level in VBA? I like to compare the use of periods in VBA to the use of backward slashes in a folder's address. What these two symbols do in their respective areas is connect the previous level to the next level. Another way of picturing this is that they are the stairs from one floor to another in a home. You can't go from the basement to the first floor without using the stairs to get there. So if we leave out any of these levels in our code, the VBA language is going to assume the respective level reference above. Lets look at a few examples of how we can shorten our code and understand what that means. The Visual Basic Editor Wants To Help You! Last but not least I want to leave you with a tip and you may have noticed this while typing in the Visual Basic Editor. Every time you type a period after one of your 'levels' you may have noticed that a little window pops up with a bunch of words. What this floating box displays is every possible word that can come after your previous code phrase. This is a feature that I often ignored when first learning how to write VBA code because I really didn't understand what it was. Eventually I took the time to figure out what it was showing me and the below little box has helped prevent errors in my code ever since. Share Your Code Writing Tips! If you have any tips that you would like to share with all the VBA beginners out there please leave your tips below in the comments section. I will try to compile them into a tips page so everyone can read them in one place.